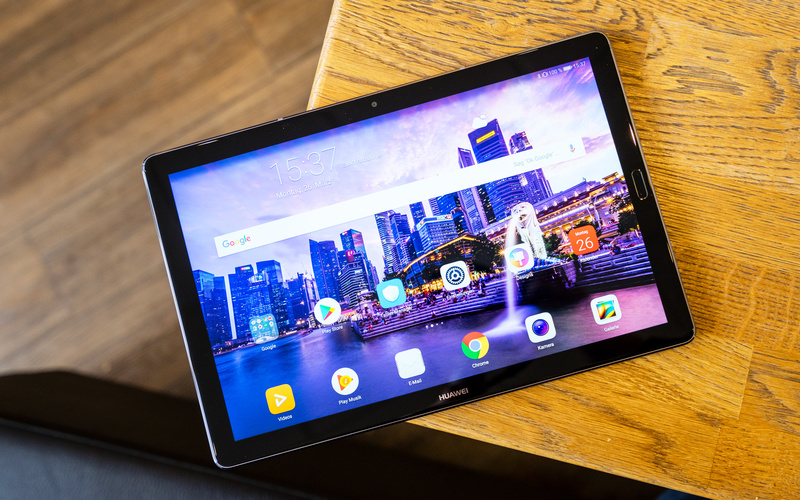 The Huawei MediaPad M5 10 is a premium Android tablet with a lot of high-end features like a great performance, a fingerprint scanner, and outstanding speakers. Read my review to find out how good it really is. The Huawei MediaPad M5 10 is a new premium tablet with a high-resolution display, fast hardware, and Android 8.0 Oreo. Its other highlights include four speakers, a fingerprint scanner, and an optional keyboard cover. But how good is it during everyday use? That’s what you’ll find out in my Huawei MediaPad M5 10 review. I got my Huawei MediaPad M5 10 in Germany for 399 Euros and prices should be similar in other regions. As of now, it is available in Europe only but that should change soon. According to Huawei, the tablet will be released almost worldwide including the United States and all over Asia. Alright, as you can see, the design of the Huawei MediaPad M5 10 is really nice and it feels very high-end. Because it is. In fact, the body is completely made of aluminum. The edges are curved a bit and because of that, it is comfortable to hold. It’s not to heavy with a weight of 498g and not to thick with 7.3mm. However, it is not the thinnest tablet out there. That record is still held by the Samsung Galaxy Tab S2 with just 5.6mm. On the right side, we get a power button and the volume controls. All the way on the bottom is a USB Type C port and a PIN connector for an optional keyboard. On the right side, there is a micro SD card slot. If you have the LTE version, the SIM card goes into the same slot. I didn’t mention a 3.5-millimeter audio jack. Well, because there is none. Instead, Huawei is shipping the tablet with a USB Type C to headphone adapter. That is really disappointing because there is more than enough room on a tablet. Well, if you want to use headphones, you have to remember to bring the adapter, use Type C ones or a Bluetooth headset. Like most higher-end tablets, the MediaPad M5 10 has a fingerprint reader on the right side of the display. That way you can unlock it without heaving to type in a password. And indeed, the fingerprint scanner works very precise and is fast. The fingerprint sensor supports gestures. With those you can replace the standard “home”, “back” and “recent apps” buttons. During my time with the tablet, those gestures worked great most of the time. However, sometimes the home gesture wasn’t recognized immediately. That might be a problem with my device only – if not then Huawei should be able to fix that with an update. On the back, we get a main camera with a resolution of 13 megapixels and on the front, we get an 8-megapixel camera. The camera on a back stands out a bit but does not feature a LED flash. Considering this is a tablet, the picture quality of both cameras is really good. Most tablets can record videos in 1080p only but the MediaPad M5 supports 4K videos too. And you can take pictures in the RAW format. While the images and videos look great for a tablet, the cameras are not as good as with recent smartphones. On the bottom and top, we get two soundbars with two speakers each. So, like the iPad Pro, the MediaPad M5 has four speakers in total. And indeed, for a tablet, the sound out of those speakers is really good. I enjoyed listening to music and watching movies with it. Obviously, you’ll get a better sound with good external speakers. But again, for a tablet the audio quality is great. The Huawei MediaPad M5 10 has a 10.8-inch display with an aspect ratio of 16:10 and a very high resolution of 2560 x 1600 pixels. It has a higher resolution screen than the Samsung Galaxy Tab S3 (review) or Lenovo Tab4 10 Plus (review). And yes, especially texts and icons look very sharp on this tablet. Other aspects of this screen are great too. Colors look nice and saturated, the contrast is good and the viewing angles are wide. Another positive is that the screen is fully laminated. That means that unlike the new iPad, there is no air gap between the IPS panel and touchscreen. The display is bright enough as well, but not the brightest out there. I’ve been able to use it outside but in direct sunlight, you will see your own reflection. The Samsung Galaxy Tab S3 offers a bit nicer screen with its Super AMOLED display. So overall the display is good, but Samsung’s is a bit better. Inside the MediaPad M5 10 runs a HiSilicon Kirin 960s octa-core processor that is made by Huawei itself. Four of those cores are clocked at 2.1GHz and the other four at 1.8GHz. In addition to that, we get 4GB of RAM and a 32GB internal storage. In the future, Huawei is going to offer versions with 64GB and 128GB as well. And you will be able to get it with LTE too. The Kirin 960s is a fast CPU but not as fast as the normal Kirin 960 which sits inside the MediaPad M5 8 and MediaPad M5 Pro. With the later ones, the four high-performance cores are clocked at 2.4GHz instead of 2.1GHz. Well, the SoC is about a year old already but that doesn’t matter that much. Other manufacturers like Samsung and Apple use older chips for their tablets as well. That’s a bit sad. But however, that makes the MediaPad M5 the fastest Android tablets currently available. My benchmark tests show that as well. In the Geekbench 4 Single-Core-Test, the M5 10 got 1636 points and 5623 points in the Multi-Core-Test. In the AnTuTu benchmark, it got a result of respectable 17349 points. As you can see in my benchmark comparison, that makes the MediaPad M5 10 one of the fastest Android tablets I reviewed. However, in the Geekbench Single-Core-Test, the Samsung Galaxy Tab S3 is just a bit faster. And the MediaPad M5 8 is just a bit faster overall. During my everyday use, the performance was as great as the benchmarks suggest. I did not have any issues with everyday tasks like watching YouTube and Netflix or surfing the web in Chrome. The multi-window-feature build into Android works great as well. I often used Chrome and Microsoft Word at the same time without any problems. And editing pictures in Lightroom is smooth as well. In my gaming test, the MediaPad M5 10 got very good results too. Games like Modern Combat 5 and Asphalt Xtreme run great at high graphics settings. And that is the case for Into The Dead 2 as well but I had to turn down the graphics just a bit to get no lags at all. That goes for Player Unknown Battlegrounds Mobile as well. It runs smoothly at highest graphics settings most of the time. But to see no lagging at all, I would suggest turning down the settings a bit. The Huawei MediaPad M5 10 is the first tablet to ship with Android 8.0 Oreo. We’ve seen smartphones with Oreo for a long time already – but with their tablets, a lot of company’s are a bit slow. So, it sounds sad, but the M5 really is one of the first ones with Oreo. Together with Android 8.0, we get the EMUI in Version 8.0. That’s the custom interface from Huawei and if you ever owned one of their phones or tablets in the last couple of years, you will feel right at home. The UI didn’t change that much recently. As we are used to from Huawei, the interface is heavily customized. In fact, out of the box, only 21GB of those 32GB are free. There are a lot of apps and games pre-installed as well. You can uninstall a lot of them but not all. If you want, you can customize the interface a lot yourself. For example, there is no app drawer out of the box. Instead, all apps are installed onto the home screen. However, in the settings, you can activate the app drawer if you like. There is a lot of stuff in the settings and if you get this tablet, I’d recommend going through all of them once to see what you like. One of the few new software features is the desktop mode. If you have the official keyboard cover the desktop mode is activated automatically once you connect it. But you can activate it manually too – for example, if you want to use it with another keyboard and maybe even a mouse. The desktop mode kind of looks like a mix of Android, Windows 10 and even Windows XP. Well, XP only because of the standard wallpaper. Anyways, just like in Windows we get a kind of start menu, a taskbar and a notifications bar. That really kind of looks like Windows 10 but it is Android. While in desktop mode you can open apps in windows and open them next to each other or on top of each other. However, some app work in full screen only and among those is Chrome. And sometimes you can open an app in a window but not change its size. Well, as I said you can’t open Chrome in a window but you are able to do that with Microsoft’s Edge browser. I think the desktop mode is a great and interesting idea. I might be the only one but I do indeed work with every tablet I review. And I welcome any additional productivity features. But during my review, I didn’t enjoy the desktop mode that much. The desktop mode feels a bit sluggish. And, as I mentioned, you can’t open all apps in windows anyways. It’s a great idea but Huawei has to improve the performance of this mode before it is really useful. Instead, I preferred to use the standard multi-window-feature build into Android. That works great and is much faster. Let’s take a look at the battery life. Inside the Huawei MediaPad M5 10 sits a battery with a capacity of 7500mAh. In my standard battery test, the tablet lasted 12.5 hours. So the M5 10 is not on the top of my battery life comparison, but for such a powerful tablet the result is great. For my battery test, I’m always looping an HD video and 50 percent brightness and activated WiFi. During my everyday use, the battery life was very good as well. If you use it occasionally with watching YouTube and surfing the web in Chrome, the battery should last you several days. Obviously, it depends on what you are doing. It lasted me a whole day while working with this tablet, using Chrome, Microsoft Word and an hour-long Skype video call at maximum brightness. Alright, can I recommend the Huawei MediaPad M5 10? As you have seen, I can indeed. The build quality, display, and performance are very good. And at the same time, we get great speakers, a fingerprint scanner, and a decent battery life. However, it is not without flaws. I think that a media tablet should offer a standard headphone jack. And I think the interface is customized a bit too much. I can live with it but overall I prefer vanilla Android – similar to what we get with Lenovo tablets. Starting at 399 euros and probably a similar price in US dollars, I don’t think the MediaPad M5 10 is too expensive. Obviously, it is not cheap, but for a premium tablet, that price is alright. The biggest competitor is the Samsung Galaxy Tab S3 with its nice Super AMOLED screen. But usually, that one costs over 100 dollars more. I see it more of a competitor to the MediaPad M5 Pro. Another direct alternative is the new 6th generation Apple iPad. That one offers a premium build and a great performance as well. And starting at 329 Dollars it is quite affordable. However, unlike the MediaPad M5 10 it does not offer a laminated screen. Huawei MediaPad M5 10 Review:The Huawei MediaPad M5 10 is an almost perfect Android tablet. It features a great build quality, an outstanding performance, good speakers, and features like a fingerprint scanner. In addition to that, the battery life is good and we get recent Android 8.0 Oreo. However, the MediaPad M5 10 is lacking a standard headphone jack and the software customization's are too heavy for my taste. Dear Sir does Huawei MediaPad M5 10 support voice calling via 4g sim? Yes, as long as you get the 4G version.